The Baby Swimming Shop has to be one of my favourite new online retailers for children's swimwear and accessories. I have a review of some lovely items going live soon, so make sure you keep an eye out for that. The website is super easy to use and stocks swimwear for children ages 0-14 years, so you can do all your holiday shopping online in one place (perfect for us time short parents). I am pleased to announce that I'm offering one of my lucky readers the chance to win a £50 Baby Swimming Shop shopping spree. 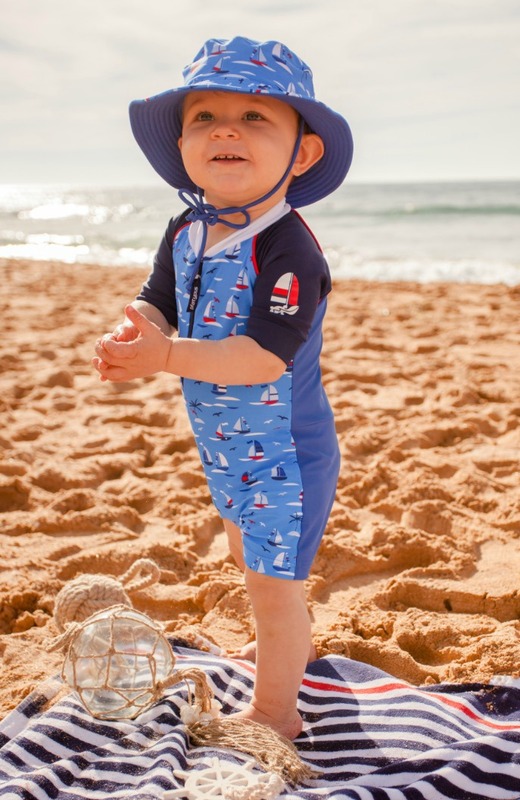 All you have to do to enter is via the Rafflecopter form below for your chance to win, but first here's a peak at this season's hottest pieces from the current Baby Swimming Shop collection to get you excited and to ensure you have the best dressed kids on the beach! I love this little set, so cute! I was so tempted to buy it for my son but we are not going on holiday this year. 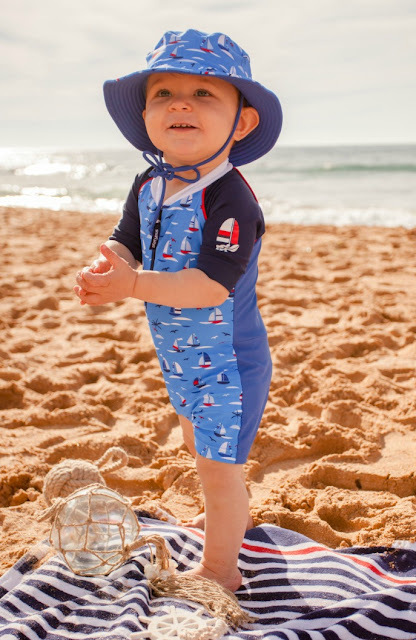 It is the Platypus Australian Regatta baby sunsuit £28.50 and bucket hat £17.95. 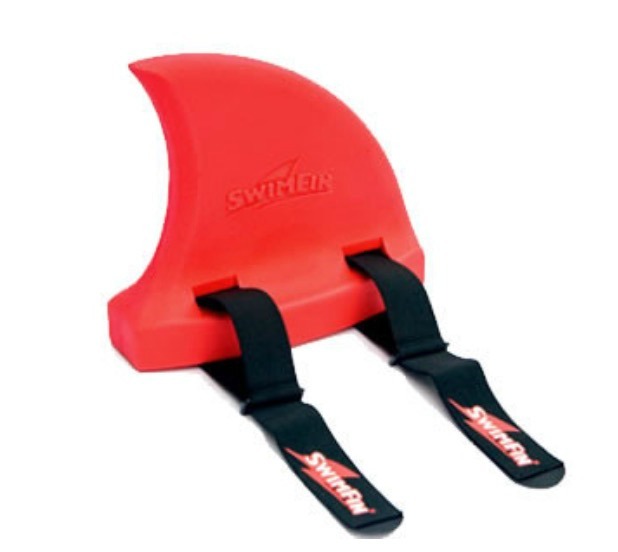 I also love this great SwimFin learning accessory £21. So as you can see The Baby Swimming Shop stocks a really great range of children's products, perfect for holidays or days at the beach this summer. To be in with a chance of winning £50 to spend at The Baby Swimming Shop simply enter via the Rafflecopter form below, but be quick as the giveaway is only open for one week and will close on Sunday 29th May 2016. T & C's apply - please see below. Open to UK entrants aged 18 + only. One winner will win £50 worth of products from the baby swimming shop, no cash or prize alternative. Winner will be selected at random via Rafflecopter from all correct entries received by the closing date. Entries will be verified so no cheating! Winner will be notified via the e-mail address provided and winners details will also be displayed on the Rafflecopter widget after the giveaway closes. Winner will have 28 days to claim their prize before another winner will be selected at random instead. Prize will come direct from The Baby Swimming Shop. I'd order the PLATYPUS AUSTRALIA Flamingo UPF50+ Short Sleeve Rash Vest with Bandeau Bikini for my daughter thanks! The shorty wetsuit would be lovely for my daughter. I'd buy a Konfidence NeoNappy in blue and an Original Konfidence Jacket in navy/blue. I'd order the Snuggle Monkey Towel or a swim fin. I would get my son a wet suit and a shark fin!!! The children have recently moved into the big pool and are finding the water a bit chilly so I would invest in a wetsuit for them. I particularly like the Konfidence Shorty Wetsuit. I'd get the Zoggs Swim Ring in blue and the Cuddledry Giraffe Print Organic Apron Baby Bath Towel. Emma Schofield. The snuggle monkey dress up towel. I'd buy the Splash About Warm In One - Pink Blossom suit.